Italian hillsides are about to reverberate again to the distinctive crackle of a Saab two-stroke engine. 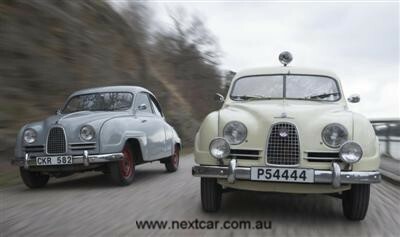 Providing the soundtrack will be Saab Automobile CEO Jan Åke Jonsson and Saab Automobile Chairman and Spyker Cars CEO Victor Muller, who will each drive a 1957-vintage Saab 93 at this year’s historic Mille Miglia road race. The two executives are celebrating the 93’s class win on this unique event 53 years ago with cars prepared by the Saab Car Museum in Sweden. Jonsson and Muller will be following, at a more leisurely pace, in the wheel tracks of the 1957 class winner crewed by Charlie Lohmander and co-driver Harald Kronegård. Today’s annual classic revival of the 1,000-mile (1,600 km) Brescia-Rome-Brescia route is held over three days on open roads and decided on punctuality between check-points. Jonsson and Muller will be co-driven by their sons, Christian, 38, and Olivier, 18, respectively. Powered by a 45 hp, 748 cc, three-cylinder engine, but weighing only 810 kilogrammes, the Saab 93’s agile handling and good aerodynamics enabled it to embarrass far more powerful, larger cars. Saab’s 1957 Mille Miglia success was followed by Erik ‘Mr Saab’ Carlsson’s overall victory on the Finnish 1000 Lakes Rally later the same year, both results bringing early international recognition for the Saab brand. Carlsson would go on to achieve back-to-back Monte Carlo wins and a hat-trick of RAC Rally victories in the early 1960s.